The Bundesliga boasts the biggest crowds in world football, and those fans watch their heroes perform in some of the most cutting edge stadiums on the planet. In a three-part series, bundesliga.com looks at the state-of-the-art stages on which the stars of Germany's top tier perform. Click here for parts one and two in our series! Are you a Bundesliga Super-Fan? Prove it by taking the Fan Challenge! 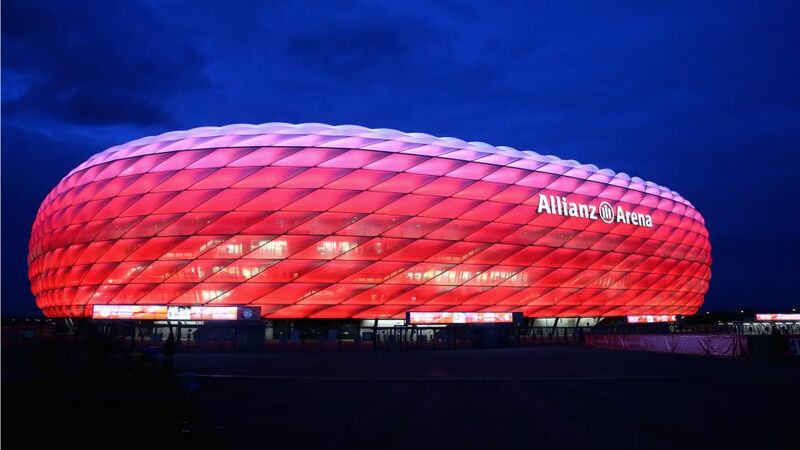 Given its unique aesthetics, made up of 2760 LED-lit panels, there can be no mistaking Munich's Allianz Arena. The panels, containing a total of 300,000 LEDs, can be lit in an array of colours and, on a clear day, the venue can be seen from as far away as 75km. There is a high-tech feel on the inside of the arena too, with standing areas behind the goal convertible into seats in a matter of minutes, while the 9,800-capacity car park to the south of the stadium is the biggest football stadium parking lot in Europe. FC Schalke 04 fans can take delight in having the largest big screen in Europe, with a surface area of over 305 square metres, more than twice the size of its predecessor. The VELTINS Arena also has plenty to offer on the inside, with the tunnel out onto the pitch decorated to replicate the tunnel of a mine, reminding players of the traditions of the industrial district in which the stadium is built. VfL Wolfsburg became the first Bundesliga club to fit their stadium with LED floodlights during the 2016/17 winter break. "We're delighted that our fans and partners are going to benefit from this innovative technology," said Wolfsburg director Thomas Röttgermann. In addition to the perfect light quality, the Volkswagen Arena is now able to produce stunning lighting effects to render the night match experience even more spectacular, as the Wolves have been doing since the venue opened in 2002. A former British army barracks was located on the grounds of Borussia Mönchengladbach's home up until the mid-nineties, and it will not be long before fans will once again be able to find a bed just a stone's throw from their seat, with a new complex, including a 126-room hotel with Borussia-themed rooms, due to open in September 2018. An interactive museum detailing Borussia's history is also part of the blueprint alongside Gladbach's footballing temple. The current stadium which stands in the forests to the south of Frankfurt is the fourth version to be built in the same location. The original Waldstadion opened in May 1925, with the venue taking on its current form between 2002 and 2005. During its latest redevelopment, the running track was removed and stands were extended to be even closer to the pitch – beforehand, fans were up to 125 metres away from the action - while the most distant spectators are now just 60 metres away. Bizarrely, Eintracht's local rivals 1. FSV Mainz 05, FSV Frankfurt, SV Wehen-Wiesbaden and Kickers Offenbach have all played at least one 'home' game in the venue. 1. FSV Mainz 05's sporting explosion necessitated the construction of a new stadium in 2011, to replace their old Stadion am Bruchweg, which could not be expanded any further. A new location was therefore necessary, and it was found in February 2008, even if it may not be to everybody's liking: the Opel Arena was built inside a valley which is renowned for funnelling the area's cold wind. Matchday sale of scarves is rumoured to have doubled since the move.